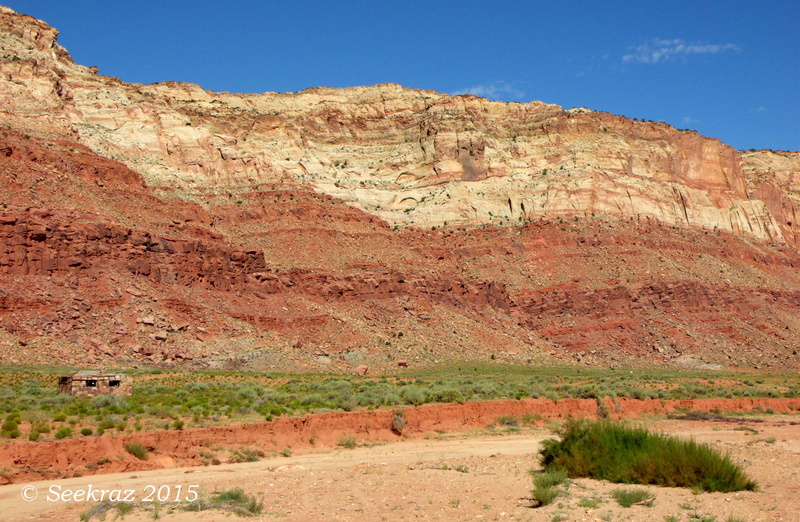 I had thought these were the Vermillion Cliffs, thought I had seen them named as such on a map somewhere, but when I was researching them to be certain, I found that they are the Echo Cliffs…. 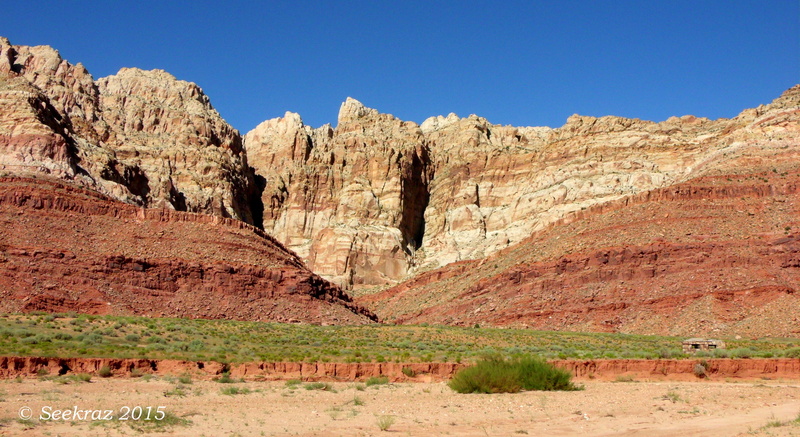 The Vermillion Cliffs are a landscape feature and national monument a bit to the north and west of these. Some might argue that this structure is not a proper hogan…and they might be right. 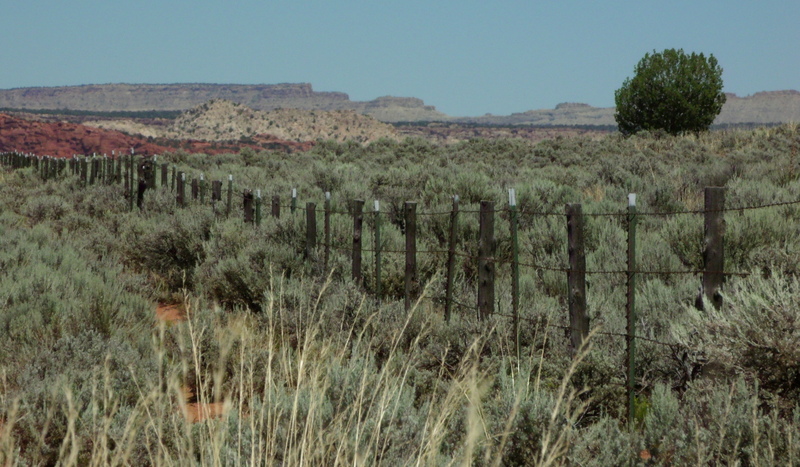 But I have seen several of them scattered about this bit of the Navajo reservation and they fit the concept of what I understand a hogan to be…a traditional Navajo home or lodging. Some of the ones I’ve seen along this stretch of road have been more circular in form, but overall, they are similar in construction and style to this sand/flag-stone house. 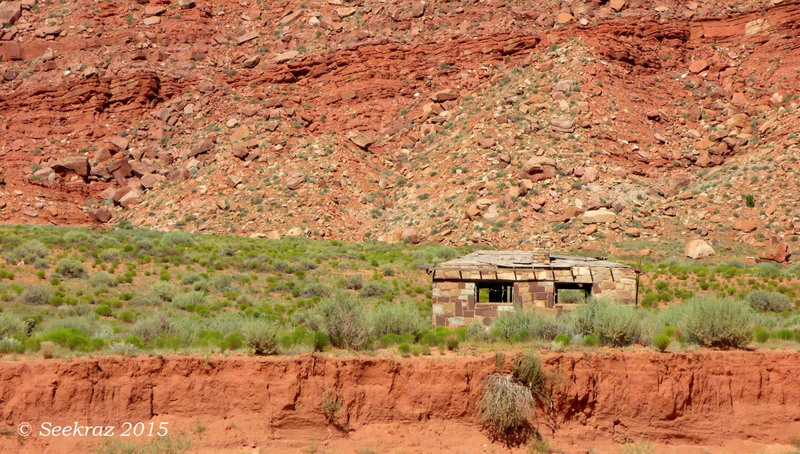 While this structure appears to be abandoned with its missing window panes, it might still be used for ceremonial purposes…but, I really don’t know. 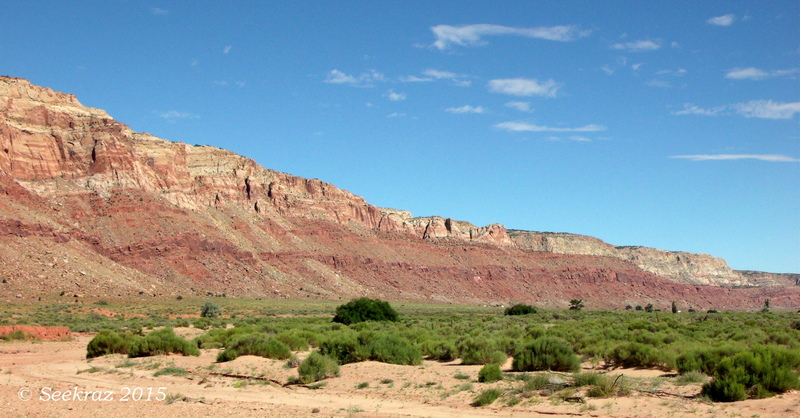 The Echo Cliffs are a prominent feature of the drive for about 45 miles along Highway 89, stretching from Gap (yes, that’s the name of a town/community) to about 25 miles south of Page. 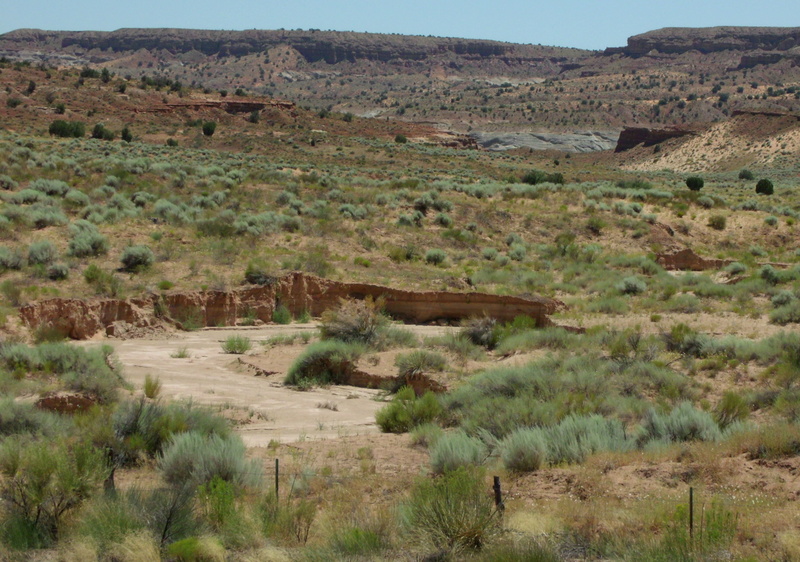 The images above and below are looking south…and if we could see past the extreme right edge below, we would be able to look out over the Painted Desert to the east. 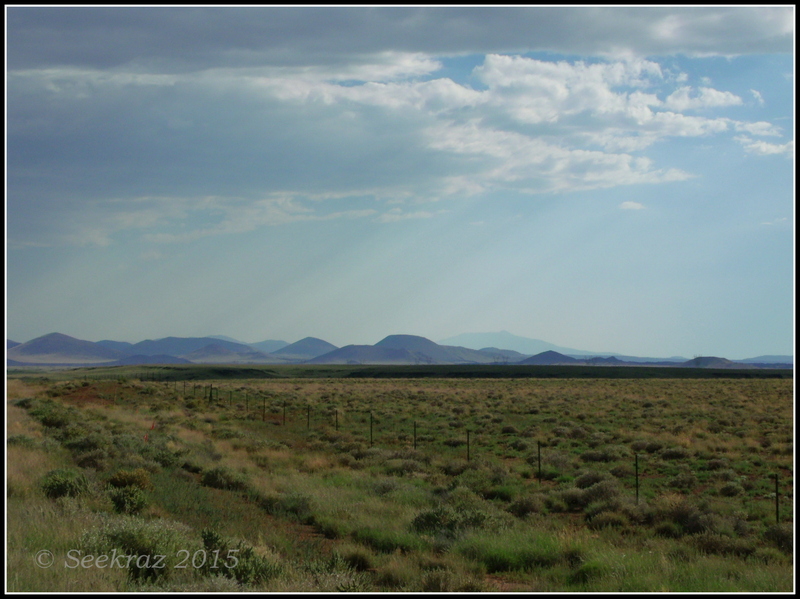 This last image is looking north from the same location…with the hogan being a couple of hundred yards to the right. This was a return, of sorts, to that former place, that home in the “used to be,” an incomplete migration, however…just a trip, a delivery, an instance of human transport from one place to another…taking my Little One to a halfway point between here and there where we would and did meet his older brother and family; a drop-off, an hour’s visitation, and then the return trip to the southern desert that is now home. 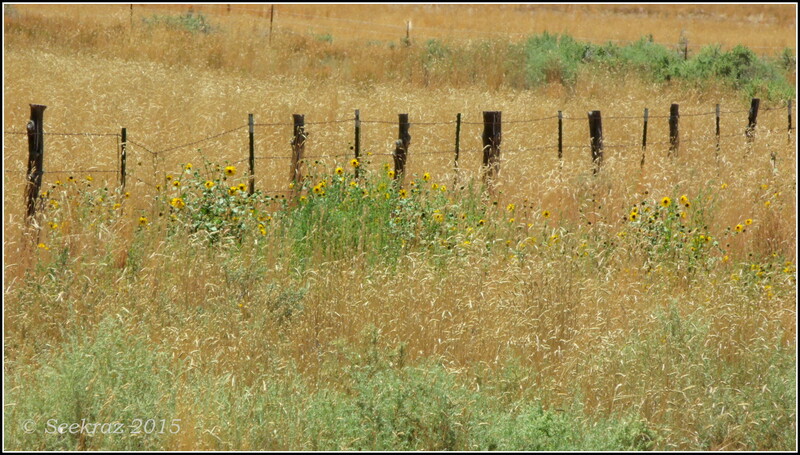 I’ve passed along this stretch of road countless times, now…back and forth, from Phoenix to Salt Lake City, this way and that, comings and goings, to one home and another, cars and trucks journeying over a familiar expanse of time and distance, emotion-laden memories, heartbeats, racing minds…acceptance…. With hours alone in the truck with my eyes and mind racing over the landscape, I recalled places in the contexts of other trips, heard echoes again of old conversations held on this road or in the places at each end of it…I remembered the road, too, and anticipated landmarks that would soon appear on the various horizons or at the end of a particular curve, around that far bend in the road and up against the fence-posts that remain in their ever places. 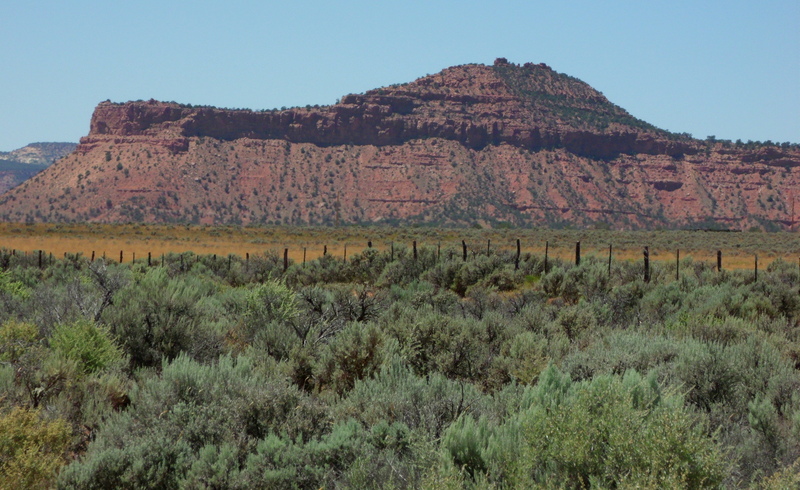 The images come from a particular stretch of that road, US Highway 89, heading south from Kanab, Utah, and representing in their randomness the terrain that exists up to just a mile or so north of the Utah/Arizona border. It wasn’t intentional, really…it just happened this way…. 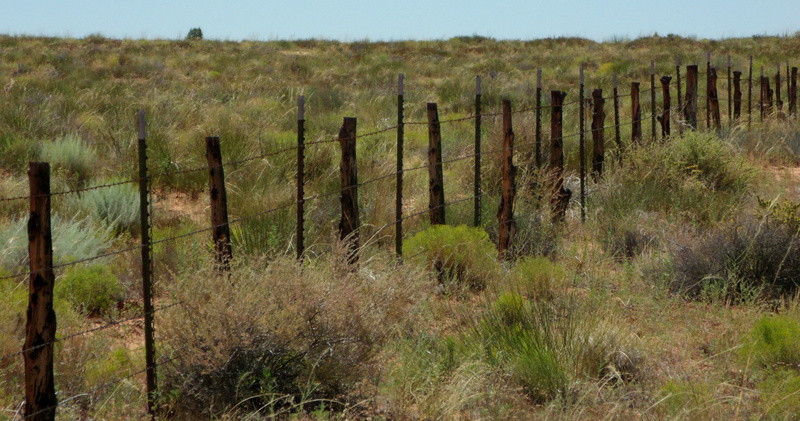 After I made a few images of the fence-posts wending their way through the waist-high grasses and the carved-away, undulating fields of silver-gray sage, it struck me that the connecting threads of what I was looking at through the camera were those lines of wire and post…the common thing drawing together that changing landscape, keeping it whole as it was separate…. 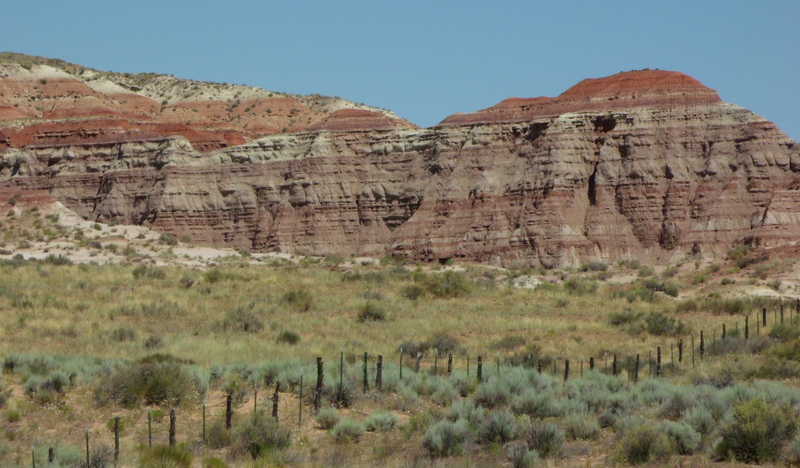 Red and purple mesas, white and gray and tan and brown rock with their layers of ancient sediment fading into cone-shaped forms of sand and dust riding down from their tops and sides onto an even lower sea-floor…golden grasses, verdant shrubs of various hues, richly green juniper trees, and the constant silver-gray of the unflowered sage…all connected and drawn into a constant vision of roadside landscape by the unspooled wire with its metal and wooden posts so ordered. 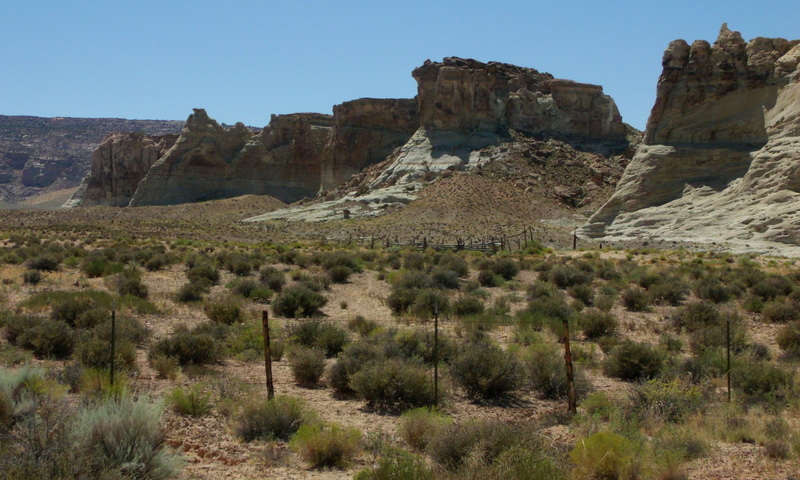 Looking north from the road at this point, in the photo below, one sees what is likely the southern edge of the Grand Staircase-Escalante National Monument…. 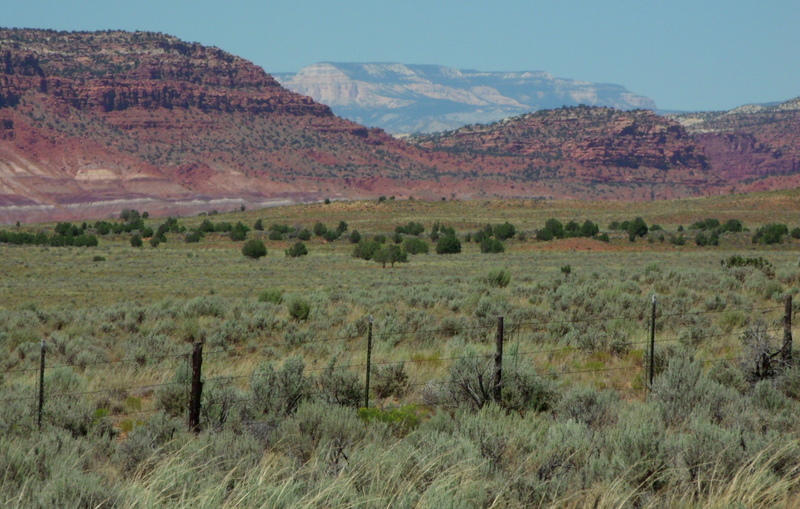 …and looking south, one can see what is likely the extreme northern edge of the Paria Plateau, the mass of land that is bounded by the Vermillion Cliffs and The Grand Canyon…south from here. 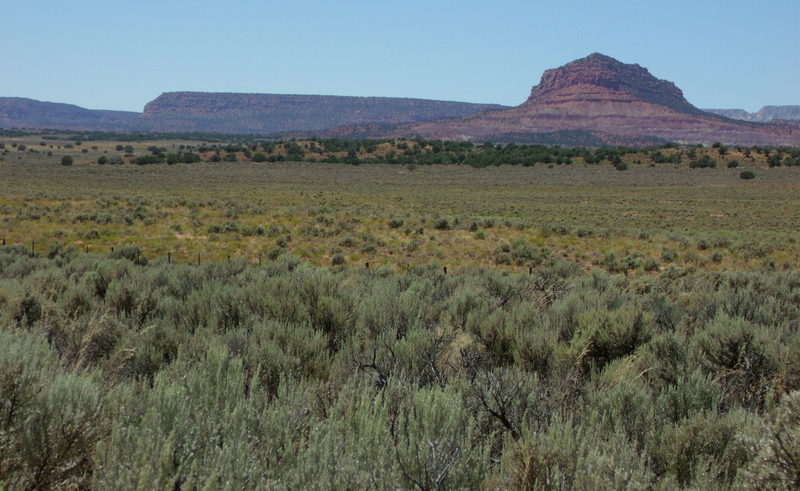 The grasses in the foreground struck me as more compelling than the skyline with the low mesa in the background of the below photo. 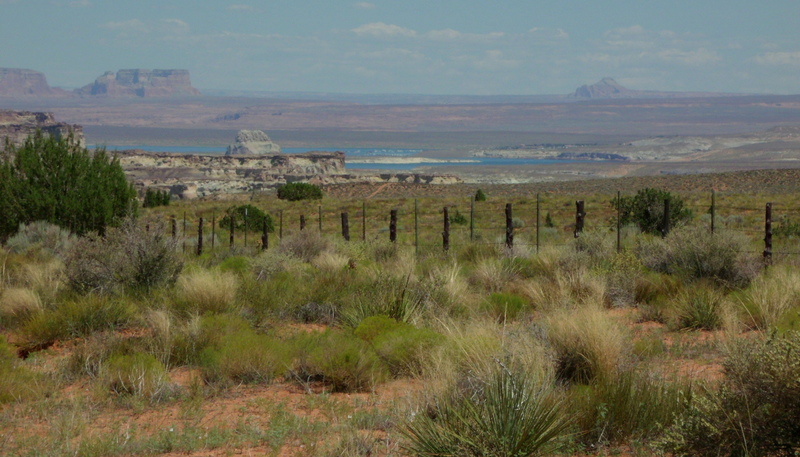 …and looking south and east…to the northern reaches of Lake Powell…. 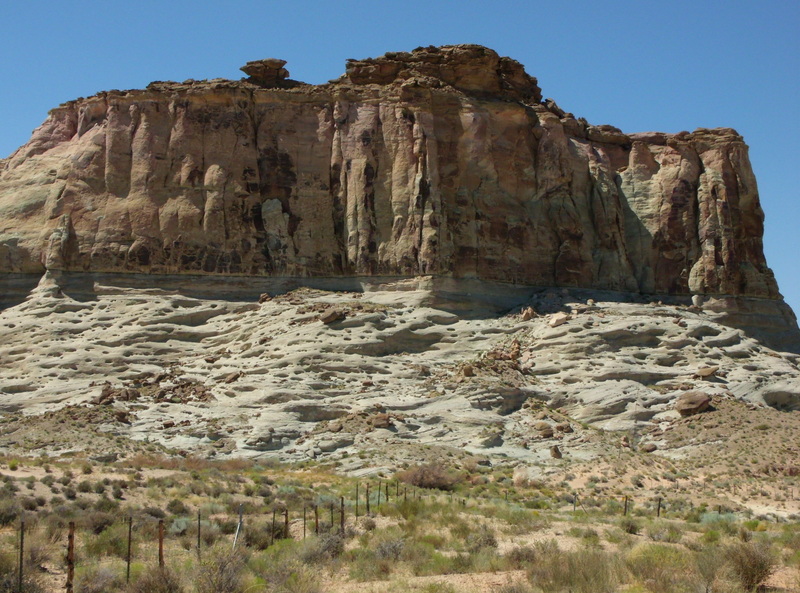 The other side of the road revealed more “plain” cliffs of dirty brown and gray…that end-up having gray/blue sediment cones running down from their edges as this mass gets closer to the lake. 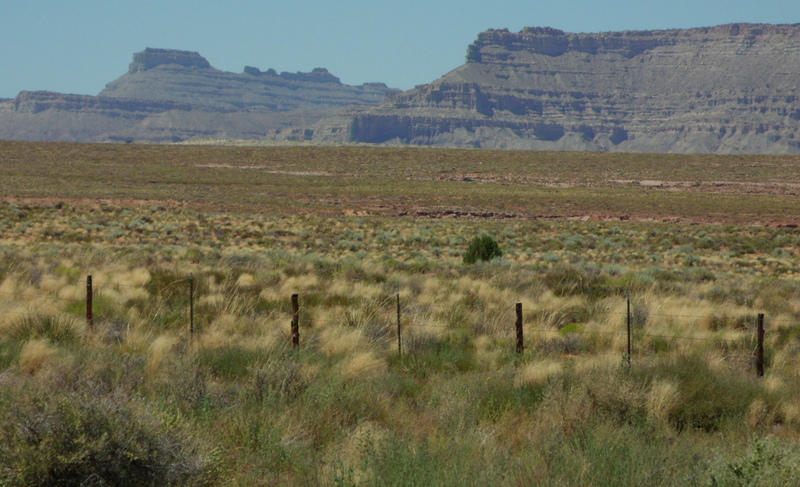 The road is now heading southeast, flying straight and fast towards the imaginary line that separates Utah and Arizona from one another…a contrivance that means nothing when watching the land flow into itself from one region to the next. 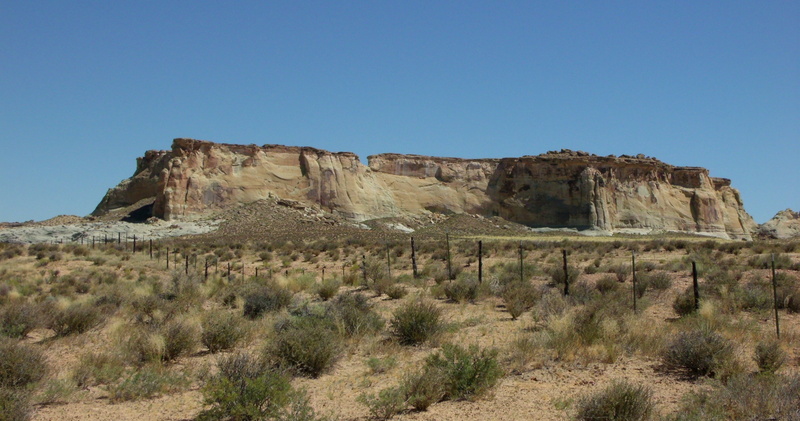 …and this one, above, is looking to the left/south at another sediment mass that is slowly losing itself with large chunks falling out of its wall and creating a cavern that has also lost its ceiling…and the last image is looking to the right/north at what is actually the forward extension of the mass (to the right and out of frame) in the first of these last three photos. 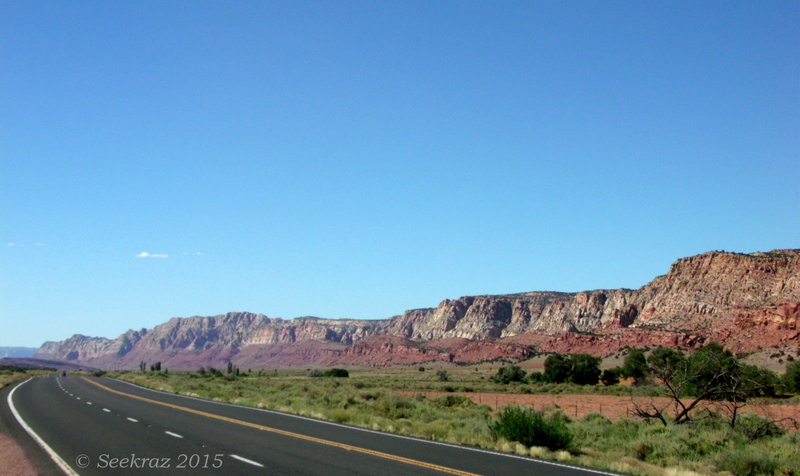 I guess that’s it…representing approximately 75 miles of scenery between Kanab and the Utah/Arizona border, these 16 images are only a handful from the several-dozen that I made along this roadway…little delays that combined to add more than two hours to the five-hour drive home. Thank you for enduring the longer post…I hope you enjoyed the drive.